What kind of people spend 15-25 percent of their monthly income on coffee, sing songs about camels and have a glorious crown of fuzzy hair atop their head? The Beja, a nomadic people group with a million and a half members who live in the northeastern portion of the African nation of Sudan. 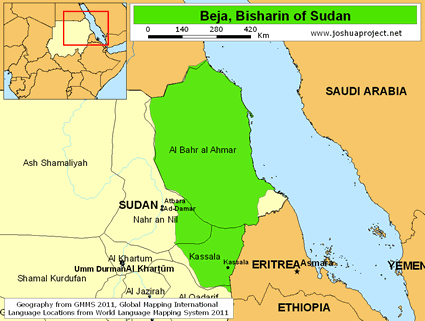 Eastern Sudan has been the homeland of the Beja since the days of the pharaohs 4,000 years ago. Despite contact with the Egyptians, along with Greeks and Romans, it was the Muslims who finally had a real and lasting impression on the Beja. Although the Beja had partially accepted Christianity in 500 A.D., their conversion was only skin deep and beginning in 640 A.D., when Arabs first invaded Sudan, the Beja began to gradually adopt the Islamic faith. The Arabs did not conquer Sudan, and although many Beja tribes still do not speak Arabic, Islam left a lasting impact on their lifestyle, customs and religious practices. In general, the Beja have always rejected authority and they greatly value their nomadic freedom. For the most part they have not changed their lifestyle or practices in the last 1,500 years. 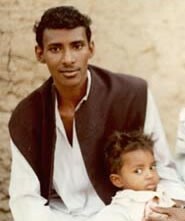 Most Beja are nomadic herders of camels and goats, although some have adopted sedentary lifestyles in the towns and cities of eastern Sudan. They divide into five distinct clans, and from these clans exist smaller groups of one to ten extended families. The sparse distribution of grazing due to little rainfall isolates the families from one another even more. With no settled homes, they live in tents made from woven palm matting and exist mainly on a diet of milk and grain, supplemented occasionally by meat and sugar. The Beja like to sing and play musical instruments, in particular the rababa, which is similar to a guitar. Since they are renowned camel herders, camels are the most popular subject matter for songs, but many songs also describe the beauty of women or speak about a longing for a special place, such as a village, mountain or good grazing lands. Coffee, or jabana, is very important to the Beja. Drinking coffee involves relaxing with friends and talking. Said one historian, "A Hadendowa [one of the Beja clans] would rather starve than go without coffee." Their crown of fuzzy hair (tiffa) has characterized the Beja for centuries. Long greased ringlets hang down from the head, which has a fluffed crown of looser hair on top. The Beja often marry cousins. Polygyny is unusual, but sometimes practiced by wealthy men. In this patrilineal society, the birth of a baby boy is greeted with a trill of exaltation or with chanting, while a newborn girl is greeted with silence. Sharia, or Muslim religious law, is of some importance for settled Beja but matters little to the nomads. Salif, customary Beja law, is more important than either Sharia or modern Sudan code law. Salif emphasizes the mandate of hospitality and provides for rates and modes of compensation for all manner of physical injury, ranging from one blow through murder. The Beja are a hospitable people, always showing kindness to other clans; however, they are not necessarily friendly to foreigners. The Beja prefer cross-cousin marriages. After a marriage contract has been made, a large gift of livestock, clothing, and other goods is given to the bride's family. The goal of young couples is to have many male children and to acquire a great number of female camels. Only the wealthiest Beja have more than one wife. Throughout their history, the Beja have practiced a number of different religions, including idolatry, ancestor and demon worship, devotion to Egyptian gods, Jacobite Christianity and now Islam. Although they are Muslims, Islam is not deep rooted or well understood by the Beja. They do not make the required pilgrimage to Mecca, and many concerned with the traditional belief of do not say the regular required prayers. The Beja continue to be highly afraid of jinn, or bad spirits, which they believe exist everywhere and cause sickness and accidents maintain peace between individuals. View Beja, Bisharin in all countries. Location in Country: Al Bahr al Ahmar state; Kassala, Nahr an Nil, and Al Qadarif states, southeast River Nile.